Welcome to the Herobrine Fan Club! Welcome to the Herobrine Fan Club! The place where you can talk about your problembrines. The place where you can get people for your Herobrine Hunt. The place where you can play games. I am the owner, Herobrine!! Not the real one, but a fake one. Below here are the latest Herobrine Spottings. Look carefully to see if one of them look interesting to you. I see many of you just join the fan club then just quit. If you think you'll do that, then don't join. If not, then please visit the fan club often to see if anythings going on. Herobrine Shrine in a Desert? Herobrine is haunting my world. 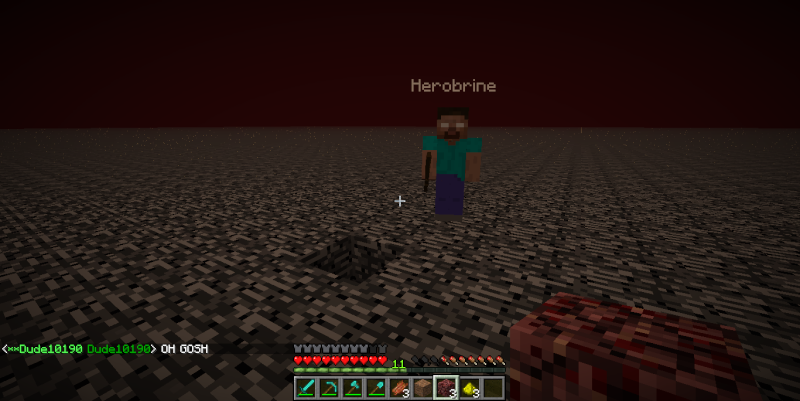 I am back with another Herobrine sighting, although not from my world. This footage was sent by a player claiming to have seen Herobrine on his singleplayer world. The sighting contains the same elements I came across: a mine with a door, a chest and some redstone torches. What do you think? Is it real? Has something like this ever happened to you? Some people think herobrine is fake, But he is REAL! I trolled my friend into using the seed "nyan" LOL!!! So after a very, very ,very log pause i am finally back. I haven't been here because of school, track and i kind of fractured my skull . But i am back and happy to be so. Sign that says "GET OUT" ? I was walking along when I saw 1 glass placed and soonafter found a desert temple. I fell down and died when in the temple But after I spawned I walked about 100 squares and found a sign that said "GET OUT" Could this be Herobrine???? Could Herobrine be on my SP world?! I was on a LAN world with my brother, Team_Flare_Grunt and we had the difficulty on hard. Yes he is my brother. Day 1; we spawned near an npc village and we set up shop with the villagers. There was a nearby desert so we inspected it. We found several sand "crosses" in the desert. We ended the day in 2 beds. does anyone know how i can find herobrine on mcpe? like a totem structure or trap or bait or anything? Real or Not Real! Answer that you believe or not! Herobrine Pocket Edition. Help me please! I can't seem to find Herobrine in Minecraft Pocket Edition. Can anyone give me some advice?